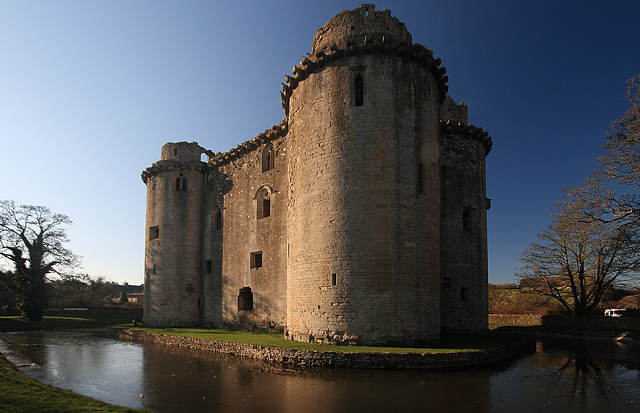 Notes: Nunney Castle is a medieval castle at Nunney in the English county of Somerset. Built in the late 14th century by Sir John Delamare on the profits of his involvement in the Hundred Years War, the moated castle's architectural style, possibly influenced by the design of French castles, has provoked considerable academic debate. Remodelled during the late 16th century, Nunney Castle was damaged during the English Civil War and is now ruined. English Heritage maintain the site as a tourist attraction. The architectural historian Nikolaus Pevsner has described Nunney as "aesthetically the most impressive castle in Somerset.By the 20th century, Nunney Castle was increasingly ruined and covered in thick ivy; as a result, on 25 December 1910 a portion of the damaged north wall entirely collapsed most of the fallen stone was stolen by local people. With the fabric of the castle under threat, in 1926 the owner, Robert Bailey-Neale, transferred the property to the Commissioner of Works who began a programme of restoration work. The castle is now run by English Heritage as a tourist attraction and is a scheduled monument. The architectural historian Nikolaus Pevsner has described the castle as "aesthetically the most impressive castle in Somerset.